Holy decadent breakfast, Batman! Or dessert, if you’d rather. Really, these would be heavenly anytime. 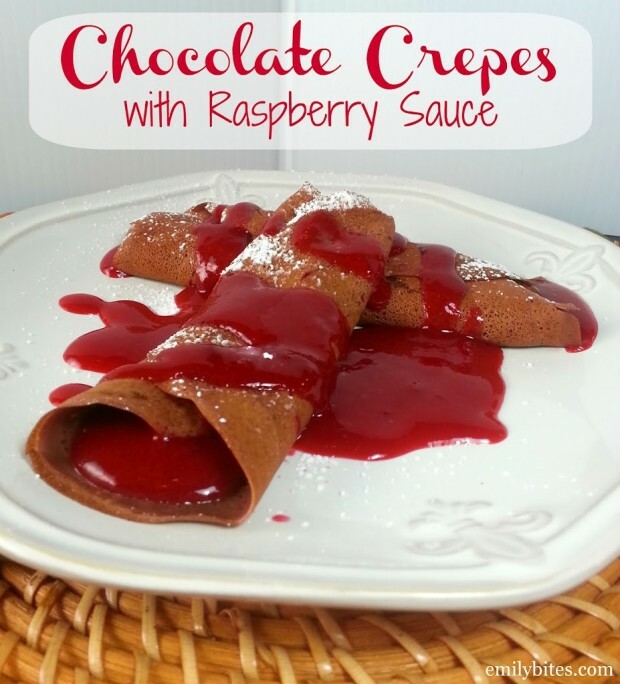 The crepes are light and chocolatey and the raspberry sauce is rich, sweet and a little tart and absolutely perfect with the dollop of whipped cream on top. I’ve had crepes on my to make list for a long time, but I was somewhat intimidated to make them since I’ve only ever seen them made on a crepe pan with one of those wooden dowel thingies. Little did I know they’re actually just as easy to make at home on a skillet! I’m not going to lie to you, straining the raspberry puree to remove the seeds for the sauce took a little bit more time than I thought it would (around 15 minutes, maybe?) but it was well worth it. That sauce is amazing. I may make more of it just to drizzle over other things. It’s really good. These crepes are perfect to serve guests for an elegant brunch or for a Sunday breakfast at home. As I mentioned above, they’d also make a fabulous dessert. The best part is, you can store any leftover crepes and sauce separately in the fridge and then just quickly assemble them when need be for the next days. Now that I know crepes are pretty easy to make, I have a bunch of ideas for other varieties. Expect to see more crepes on EB in the future! In a medium bowl, mix the milk, evaporated milk, egg whites and egg and stir to combine. In a separate bowl. Mix the flour, a ¼ of the sugar, the cocoa powder and salt and stir to combine. Add the flour mixture to the milk mixture and whisk together until thoroughly combined. Cover bowl and refrigerate for an hour. In a medium saucepan, combine the remaining 1/3 cup of sugar and the cornstarch and set aside. 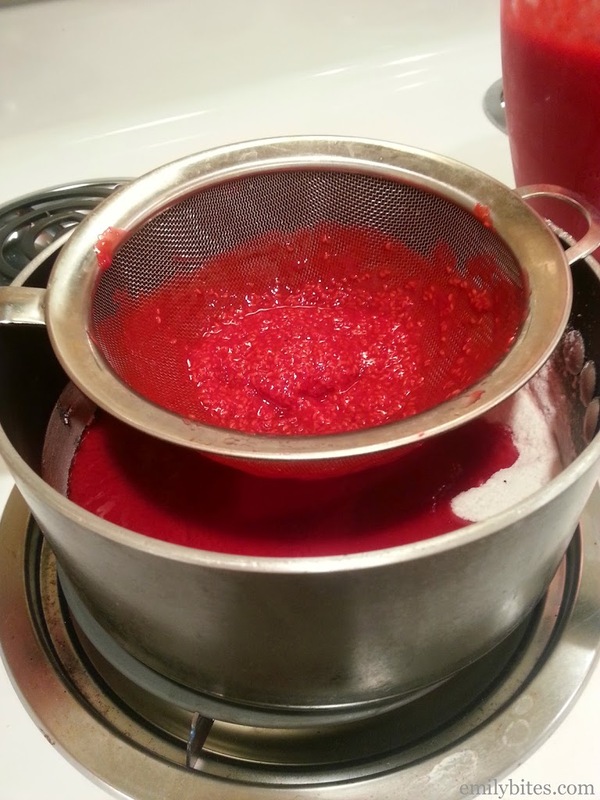 Combine the raspberries and water in a blender and process for 1-2 minutes until pureed. Strain the puree through a strainer into the saucepan in small batches to remove the seeds (see photo below) until all the sauce is in the pan and all the seeds are removed. Discard the seeds. Stir the puree into the cornstarch mixture until combined. Bring the sauce to a boil and then cook for 2 minutes, stirring continuously until thickened. Transfer to a bowl and then refrigerate until chilled. When the crepe better is chilled, mist an 8” nonstick skillet with cooking spray and bring it between medium-low and medium heat (the original said medium but I burned my first few crepes…when I turned it down a little it was perfect). Stir the batter and scoop 3 tablespoons of batter into the center of the skillet. Lift the skillet and tilt it to coat the bottom of the pan with a thin layer of batter. Cook until the top looks cooked and then flip with a spatula. Cook for an additional 15 seconds and then remove crepe to a wire rack or paper towel. Repeat with the remaining batter to make 16 crepes. When the crepes have cooled, remove the raspberry sauce from the refrigerator. Put two crepes on a plate and fill each one with a line of two tablespoons of sauce. 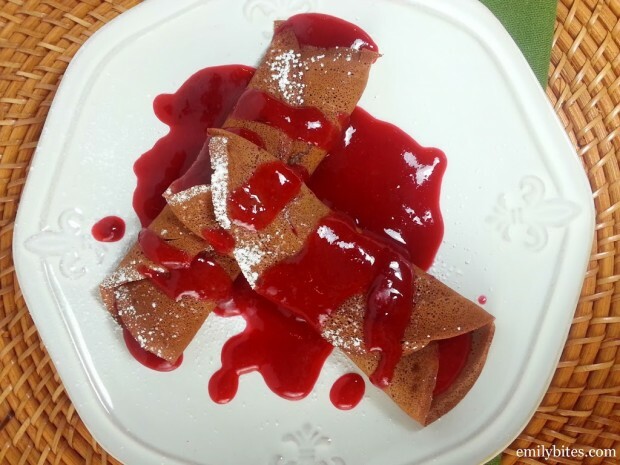 Roll the crepes over the sauce and then top each one with an additional tablespoon of sauce. Each plate gets topped with 1/8 teaspoon of powdered sugar and each crepe gets a tablespoon of whipped cream. Repeat with remaining crepes. Refrigerate any leftover sauce in a Tupperware container and any crepes in a Ziploc bag with wax paper or parchment paper between each crepe. I am so impressed that you made crepes. I have not attempted this yet! I love crepes! I haven’t had them in years because of the high calorie content, so this will be a really nice guilt free treat! Thank You! !